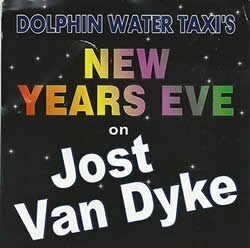 “New Year’s Eve” on beautiful Jost Van Dyke, or as Foxy’s may refer to it, “Old Year’s Night”. Thousands of visitors descend on the tranquil isle for what is the Caribbean’s largest New Year’s Eve party. Great Harbor and White Bay both explode with Calypso music and local cuisine of all kinds. It’s truly one of the more festive events the VI’s have to offer. Reserved Seating from either Red Hook or Cruz bay at the time of your choice. Reserved seating on Dolphin's chartered "Fast Ferry" returning between 1:30 and 2:30am. Free Drinks onboard your water taxi ride to Jost. With so many party-goers flooding an island built for only a few hundred, getting in and out can be a nightmare. Lines for the public ferry can get exhaustive and there’s no guaranteeing a seat using public transportation, especially on the way back after midnight. Dolphin Water Taxi's reserved seating ensures that as long as you are there by the scheduled departure time, your seat is waiting for you. Those with their own boats enter customs in Great Harbor at their own risk. Hundreds of boats fill the anchorage, starting with mega-yachts skirting the exterior, to small single engine runabouts stacked 8 across on the dock and pulled up on to the beach. However, once you get in, the party is well worth it. Fortunately, there is a way to navigate safely to Jost for New Year’s Eve and with very little hassle, relatively speaking. For years, Dolphin Water Taxi has been shuttling guests back and forth from both Red Hook and Cruz Bay, by offering reserved seats in both directions. We utilize our smaller boats during the early daytime runs and a 50-passenger mini-ferry boat for the slightly busier evening hour at 6pm. For the return, when midnight passes and your party legs are about to give out, we have a private chartered Fast Ferry whisking everyone back to US customs in Cruz Bay and then back to Red Hook. Reserved seating for Dolphin’s 1:30am to 2:30 am departure from Great Harbor means there is no anxiety wondering whether or not you will make it onboard for the return. We make it a 1-hour window for departure because our departure and boarding of the vessel is at the mercy of the Jost Van Dyke customs and Port Authority. Space is obviously limited, so reserve early!! As always, Dolphin encourages all its guests to drink responsibly, be respectful, and party safely. There are no charges for trips cancelled due to weather or maintenance. Other cancellations can be made without any charges if done ONLY by email at info@dolphinshuttle.com, as this creates a cancellation record, no later than Dec. 20, 2018. After Dec 20, 2018 tickets are non-refundable.